https://matcha-jp.com/en/794 Toji Temple and it's 1200 year History! Let's explore the long and vast history of Toji Temple and see how it meets with the modern world! The gate of this temple is so solemn you cannot help but straightening up before it. The pagoda of this temple is so big you cannot help but have your mouth hanging wide open. This is Toji temple(東寺), a world heritage site where numerous national treasures are kept. Many temples in Kyoto are deep in the mountains, but Toji temple is one of the rare exceptions where the temple is in the city area. It is only about 15 minutes walk from Kyoto station. The accessibility of the temple is contributing to its popularity among visitors. But this is not the only charm of this temple. This pagoda can be seen from Kyoto station. The closer you get to it, the more sighs will come out of your mouth admiring its hight. 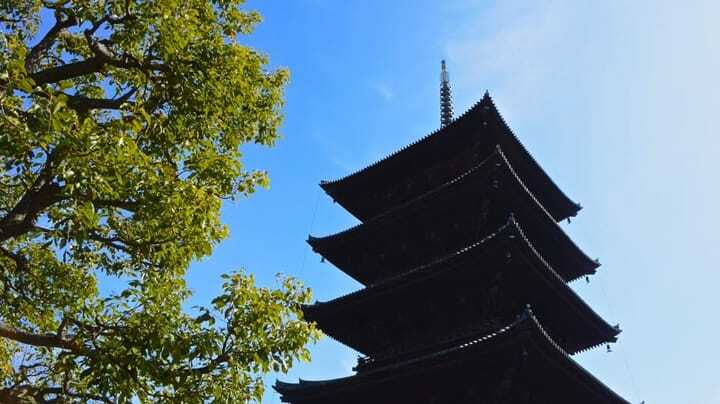 The five-story pagoda of Toji temple is 55 meters in hight, making it the highest building made of wood in Japan. It is said that Budda’s ashes, which were brought by Koboudaishi（弘法大師）, are kept in the pagoda. The five-story pagoda was built again and again each time it burnt down, and was loved as the symbol of Toji temple. The spirit of the building hasn’t changed up to this day. In spring, it shows a beautiful collaboration with the weeping cherries. There are many Buddhist statues in here. Out of the numerous numbers of statues, the must-sees are those in Kondo (金堂) and Kodo (講堂). Once you enter the hall, you will find that the scent of the incense is creating a mysterious atmosphere. Statues look upon the visitors both kindly and sternly in that atmosphere. In the Kondo (金堂), you can find the Yakushinyoraizazo whom Toji temple is dedicated for. Besides it are Nikko-bosatsu(Nikko Bodhisattva) and Gakko-bosatsu（Gakko Bodhisattva） who are the attendants. In the Kodo, 21 statues are neatly ordered with Dainichinyorai（Mahavairocana） at the center, shaping a three-dimentional Mandara. You can put yourself in this space that is a representation of the esoteric Buddhism worldview, and feel the expressions of the statues and what they mean or what the order of the statues mean. Is anyone familiar with AR technology, which enables to convey vivid information by composing three-dimentional animation and images with visual footage taken by cameras? At Toji temple, they incorporate this latest technology into their guidebook! If you read the code on your smartphone app, you can enjoy vivid videos. Not only can you take a closer look at the Buddhist statues’ face, which you usually cannot look up close, but you can also hear explanations about the architecture or Mandara. It is sure to help you understand the esoteric Buddhism worldview and Toji temple better. The guidebook is a reasonable 300 yen, and is sold in the shops in Toji temple. It will be a great souvenir from your visit to the temple. Toji temple maintains and guards the five-storied pagoda and its Buddhist statues, but also entertains the visitors with its guidebook that employs AR technology. The spacious precinct changes its expression with each season. You could soak yourself in to the sutra recitation early in the mornings, or enjoy the daily life culture of Kyoto at the Kobo market held on the 21st every month, which is crowded with many people. Toji temple is indeed an attractive temple with multiple faces.